"Our exciting findings don't just extend back the record of life living in hot springs by 3 billion years, they indicate that life was inhabiting the land much earlier than previously thought, by up to about 580 million years," says study first author, UNSW PhD candidate, Tara Djokic. "This may have implications for an origin of life in freshwater hot springs on land, rather than the more widely discussed idea that life developed in the ocean and adapted to land later." Scientists are considering two hypotheses regarding the origin of life. Either that it began in deep sea hydrothermal vents, or alternatively that it began on land in a version of Charles Darwin's "warm little pond". 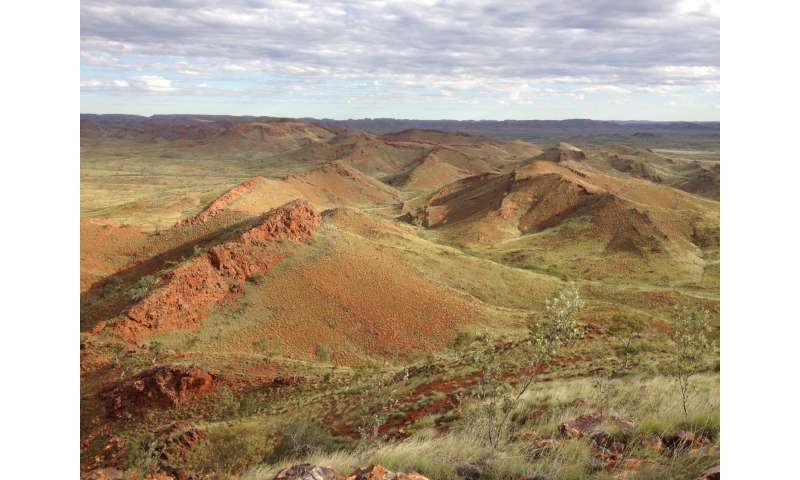 "The discovery of potential biological signatures in these ancient hot springs in Western Australia provides a geological perspective that may lend weight to a land-based origin of life," says Ms Djokic. "Our research also has major implications for the search for life on Mars, because the red planet has ancient hot spring deposits of a similar age to the Dresser Formation in the Pilbara. "Of the top three potential landing sites for the Mars 2020 rover, Columbia Hills is indicated as a hot spring environment. If life can be preserved in hot springs so far back in Earth's history, then there is a good chance it could be preserved in Martian hot springs too." They interpreted the deposits were formed on land, not in the ocean, by identifying the presence of geyserite - a mineral deposit formed from near boiling-temperature, silica-rich, fluids that is only found in a terrestrial hot spring environment. Previously, the oldest known geyserite had been identified from rocks about 400 million years old. Within the Pilbara hotspring deposits, the researchers also discovered stromatolites - layered rock structures created by communities of ancient microbes. 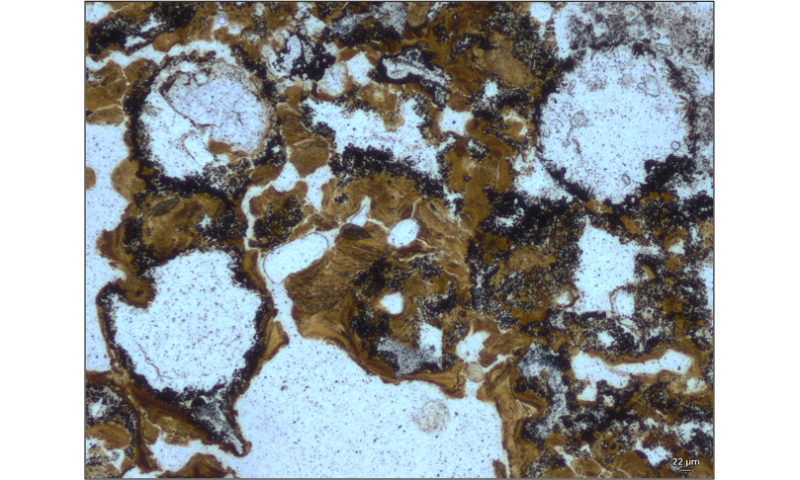 And there were other signs of early life in the deposits as well, including fossilised micro-stromatolites, microbial palisade texture and well preserved bubbles that are inferred to have been trapped in a sticky substance (microbial) to preserve the bubble shape. "This shows a diverse variety of life existed in fresh water, on land, very early in Earth's history," says Professor Van Kranendonk, Director of the Australian Centre for Astrobiology and head of the UNSW school of Biological, Earth and Environmental Sciences. "The Pilbara deposits are the same age as much of the crust of Mars, which makes hot spring deposits on the red planet an exciting target for our quest to find fossilised life there. "In September 2016, Professor Kranendonk was part of an international team that found what is possibly the oldest evidence of life on earth - 3.7 billion year old fossil stromatolites in Greenland deposits that were laid down in a shallow sea. He has also given geological advice to NASA on where to land the rover on the 2020 Mars Exploration Mission. "The Pilbara provides us with a rich record of early life on Earth and is a key region for developing exploration strategies for Mars to try and answer one of the greatest enigmas in science and philosophy - did life arise more than once in the universe?" says Professor Walter, founding director of the Australian Centre for Astrobiology. "That's why we are working to gain World Heritage listing for its main fossil sites." what? the earth isnt 6000 years old? the dating method is testable, repeatable and statistical? tell me it aint so, or my frail, lack of evidence belief system will be crushed. This looks like a marvelous find. I have no doubts that the materials examined exhibit good evidence for microbial life in the surface hot spring setting. However, I don't see why this finding should dismiss seafloor hydrothermal vents as a potential setting for the origin of life. Its a bit puzzling that evaporate deposits on surface hot springs are stressed as a 'concentrator' of complex biogenic material as if undersea hydrothermal precipitate processes aren't capable of doing that as well. In the end, though, it wouldn't surprise me in the least if it turns out that either or both settings figured prominently in the origin of life. This isn't an either-or dichotomy. Both hydrothermal vents and surface hot springs have the same important suite of properties for biogenesis...and they were no doubt equally ubiquitous on the early Earth. oldest known life found in a vent 3.5 Gya, previously oldest know life found in vent at .480 Gya. AND not only is this the oldest life found in a vent, it is the oldest life ever found, Previously, the world's oldest evidence for microbial life on land came from 2.7- 2.9 billion year old deposits in South Africa containing organic matter-rich ancient soils. Both hydrothermal vents and surface hot springs have the same important suite of properties for biogenesis...and they were no doubt equally ubiquitous on the early Earth. Maybe you have found the exactly point. Matrix/DNA Theory has suggested that the first cell system ( aka, living thing) needed 50% of a planet's nucleus energy and 50% of a star energy. The planet's energy is able to build the primordial molecules and some organelles ( less mitochondria and chloroplasts) and no DNA, only RNA. The last elements are build with the concourse of a star energy. Than, it is possible that life began at thermal vents but was finished at land surface. We are based on our theoretical model of a seed for life, which is a kind of astronomical genome at microscopic level.